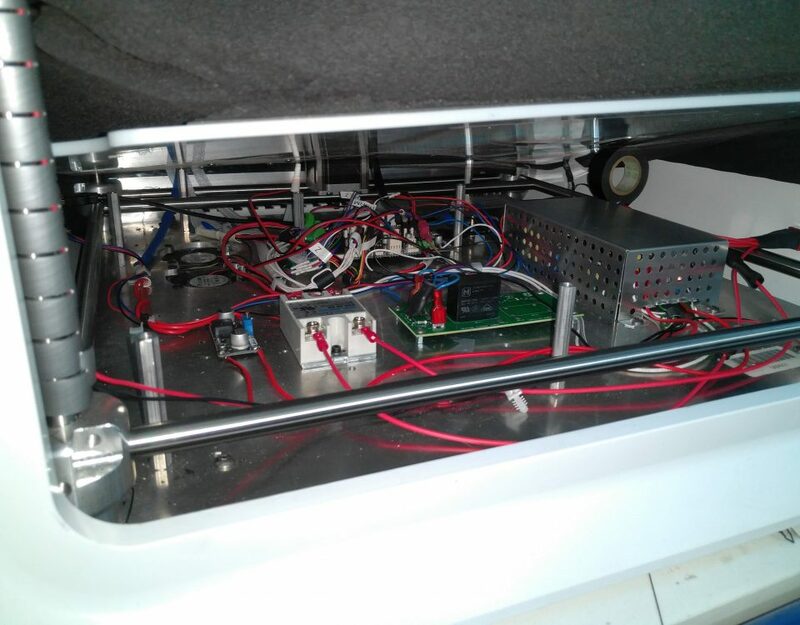 In this third and final part, we’ll be working on the heat bed, the controlled environment and finally the configuration for our Duet. The heated bed was quite a challenge. 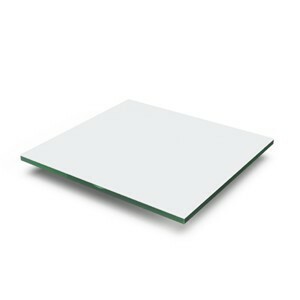 The original “Print Pad” design is simply a glass plate with a 3mm plastic sheet glued over it. It works well with PLA, but anything else is very hard to stick. Even PETG wouldn’t stick. It was crucial to add a heated bed. The original plate was easy to remove from the z-axis. We really liked this feature and wanted to keep it. The bottom had a big locating cylinder which seats in a triangular hole, on the Z axis system. 3 magnets secure the bed in place. At first, we wanted to keep it as is. The glass plate was well designed with rounded corners and magnets. It would save us a lot of time not rebuilding the same setup. After some discussion, we ended up asking for a 3 wire setup. This enables us to wire it for 240VAC and 120VAC. This 3 wire set-up separate the heating pad in 2 resistance. Wiring them in series increase the resistance and is proper for 240VAC. Wiring them in parallel reduce the resistance and is proper for 120VAC. The actual resistance path looks like a sliced layer. You can see the 4 wires (two will be merged together for one wire) and an empty space for the thermistor. As the bed was very easy to install and remove, we wanted to keep it that way for the electrical connections too. 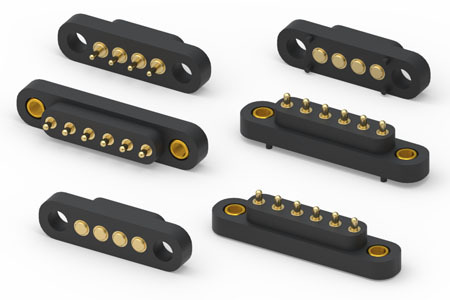 We found Mill-Max, a company specialized in high-reliability connectors. Their spring-loaded connectors were perfect for our situation. As we couldn’t thread in the glass, we machined an aluminum block and glued it using high-temperature epoxy. Sadly, the epoxy wasn’t holding well. We tried to clean the surface, sand it, glue it again, and it wouldn’t stick. The pivot movement required for removing the build plate was putting a lot of stress on the glue. We had to put the spring loaded connectors away for now and use a standard high-temperature connector. The plastic on top of the glass started warping and ungluing itself. We have reached the limit of this bed and now it is not usable anymore. Unless you’ll want to stick with low bed temperature (<70°C), it is strongly advised to upgrade it too. Glasses are more stable than metals in therm of thermal expansion. However, they are more fragile and also worse thermal conductors. These plates are easy to find and easy to work with. It can be bought from a local store and cut to size. 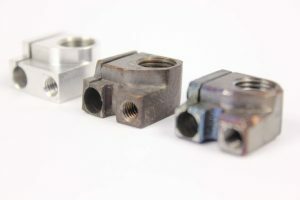 They can be machined and drilled, which is very useful for connectors, locating pins, magnets, etc. It can be an interesting solution if you don’t want the hassle of machining the plate yourself. Our heated pad will work with this plate. With this plate and a PEI tape bought from CS Hyde, we managed to print anything with great results. After the epoxy problem, we could have given a second try with the connectors, especially since they had mounting holes. However, we already had our alternative connector installed and decided to keep it there. 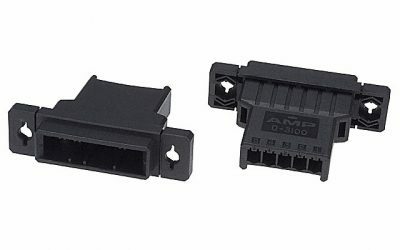 We opted for a TE Connectivity AMP Connectors Series Dynamic D-3100. The CubePro already has a good air heater for the environment. The housing is clean and elegant for an enclosed printer. We’ll give it a nice upgrade to make it even more reliable and efficient. As mentioned before, the liquid cooling system will be keeping our critical components at a cooler temperature than the environment. Depending on your goal, it is not necessary to cool each axis motor. 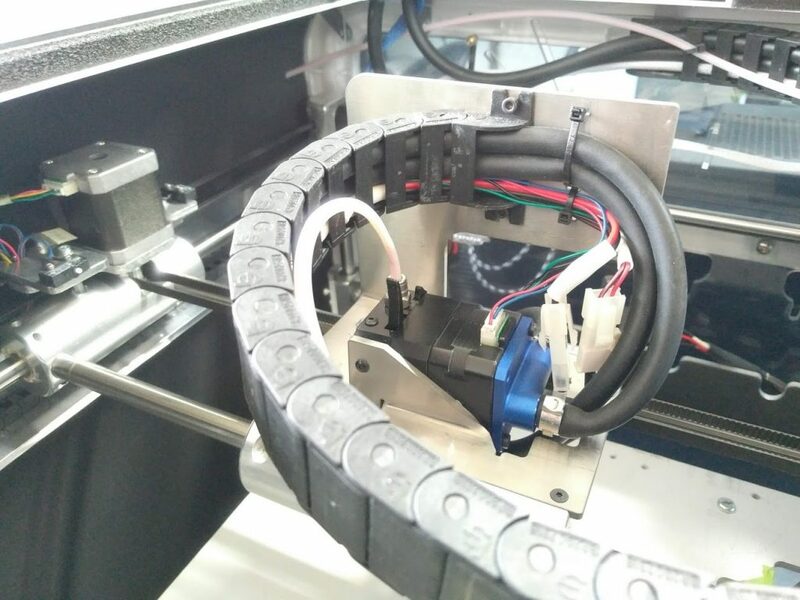 Reaching temperatures higher than 70°C can be quite tricky as much more efforts will be required in the printer. Most cables, electronics, components will fail under higher temperature. A different printer design would be a better approach. For this printer, we’ll keep a 70°C goal. Once you have decided which parts to cool, it is a good idea to run the loop first to ensure everything is working properly. It’s done very quickly and will save you a lot of trouble. The tubes were installed inside the cable chain. 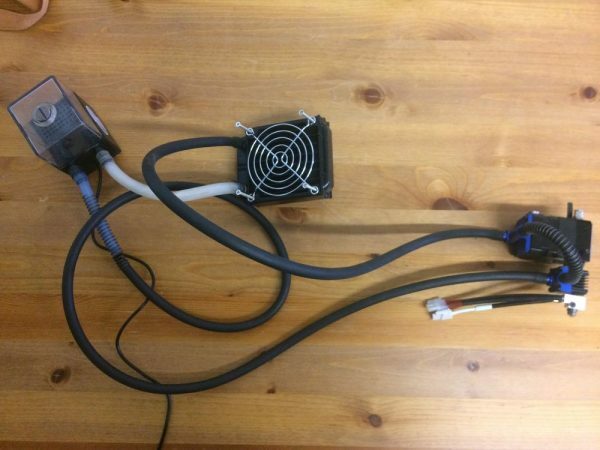 There was enough space in the original cable chain for both liquid cooling tubes, plus the cables for the extrusion system. We added insulation to increase the efficiency of heating. Also, it helped to keep the electronic section cooler than the rest. We used Buna-N / PVC foam as the insulating material. The thickness is ½ inches. 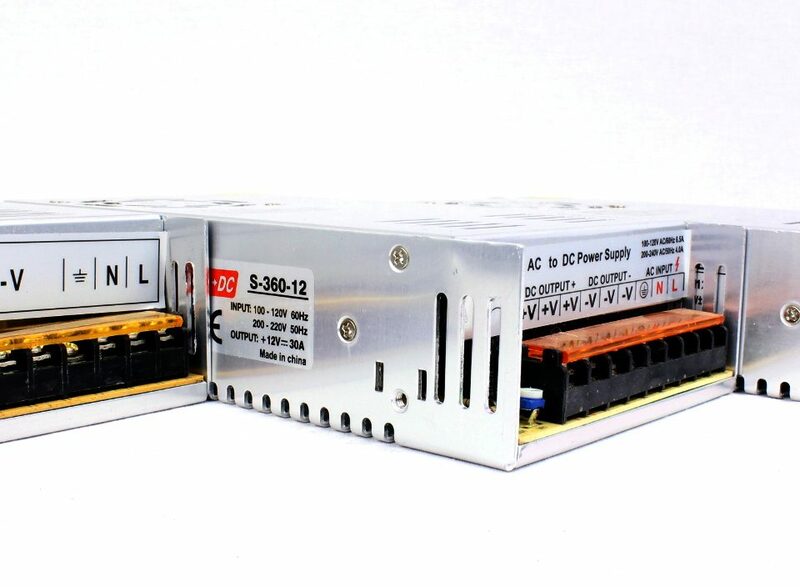 The maximum rated temperature is 105°C, which is more than enough for our application. As installation tape, we used foam mounting tape from 3M, number 5952. It was rated for up to 120°C. 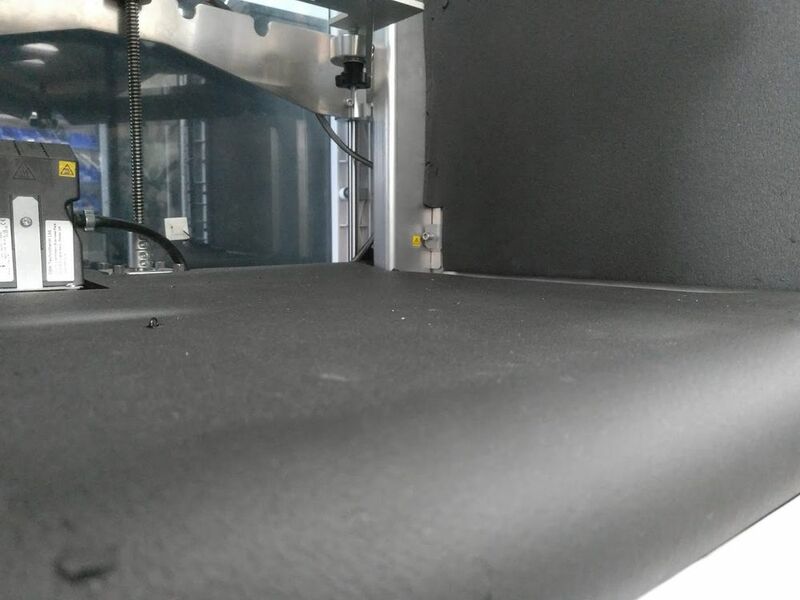 We added insulation throughout the printing zone, except for the back. This was only for preference, as the back could also benefit from additional insulation. You can check our configuration below for our Duet. The documentation is very well made and maintained. Even if the Duet community doesn’t like our 500°C thermistor because it has poor resolution at room temperature ( we don’t print at room temperature ), we’ve got very nice prints quality and no trouble at all with any aspect of this printer. Thanks for reading this tri-part blog series. I really hope that we could help some of you with their printer conversion. I’ll be happy to add any missing info. Simply leave us a comment and I’ll check for it. Thank you this blog series, it is very useful for me, because I make a same conversion on my CubePro Duo. 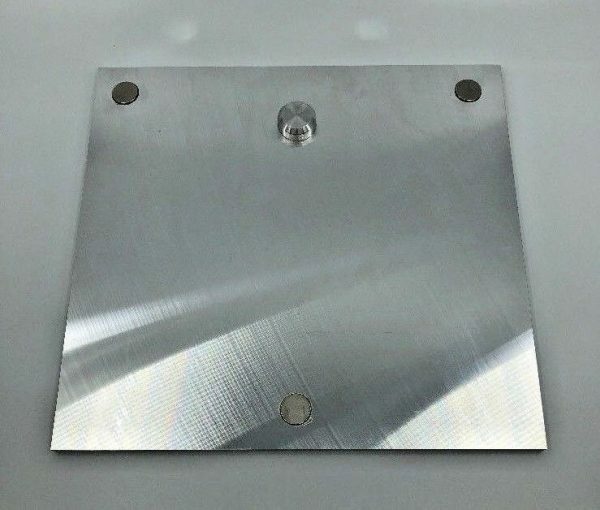 Can you give me a direct contact to the company who produced the silicone heating plate? I send they a message in Aliexpress, but they don’t answer, and I don’t find this plate in their products. I have one more question. Did you keep the original thermometer in the heated chamber? I’m still waiting for some parts, but if I’m start a conversion, I’ll probably have a lot more questions. You can try contacting s at alirubber dot com, this is the contact we used to have. 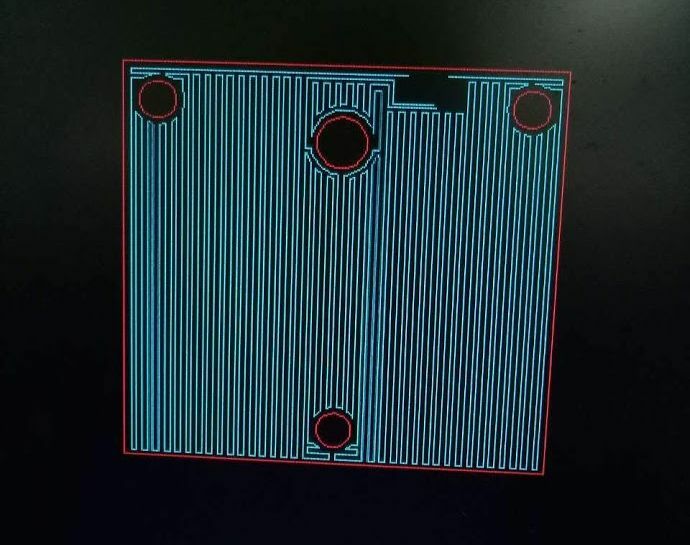 We used a 300°C thermistor we had in stock, it has good resolution at 70°C. Loved reading the blogs on this great conversion. Well done ! Am seriously considering following the steps here to upgrade a 3d printer with hopeful intention of ultimately printing Ulterm. 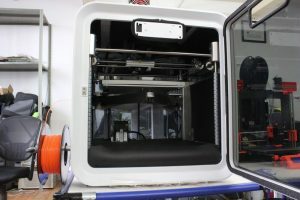 Have seen the video “DyzEnd-X Hotend Printing Demo in a CubePro 3d Printer” where its shown printing. 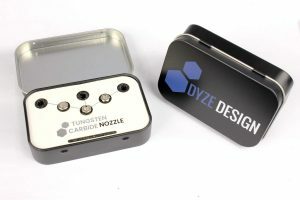 In the site store description, the DYZEXtruder rated for 500 degrees is “designed to work with any filament” It would be inspiring to see it in action printing filament at the top of the temperature range. Just wondering If Is there a video, documentation available for public viewing showing that path has been beaten ? I’d be more than happy to help you in this project. We’ll definitely put some more time into generating content such as videos and picture of high-performance polymer printing. Awesome! I have spent over $6000 on this printer and was looking for a viable upgrade path for it. Well done, This upgrade could easily pay for itself by just allowing owners to get away from the breakage prone media cartridges at $100 each not to mention the $300+ print heads that clog and have issues out of the “new” box. I’d even be willing to “kit” the cnc parts to see this “kit” become readily available through your website. Very nice guide! I have a Cubepro single nozzle that I’m trying to use standard market cartridges, so I’m looking for a solution with minimal changes. I see you keep all of the electronics except the mainboard, do you think I could use the existing hotend and stepper motors, and only need to get a Duet wifi and filament sensor? I only use PLZ and ABS so I don’t want to upgrade much. I think it is doable. However, both the extruder and the hotend have various intermediate electronic boards between the mainboard and the component. This might get tricky as we don’t know exactly what’s happening on the circuit boards. It might be trickier to try keeping the original hotend and extruder. Also, these components are the source of many problems. I would strongly suggest changing them. 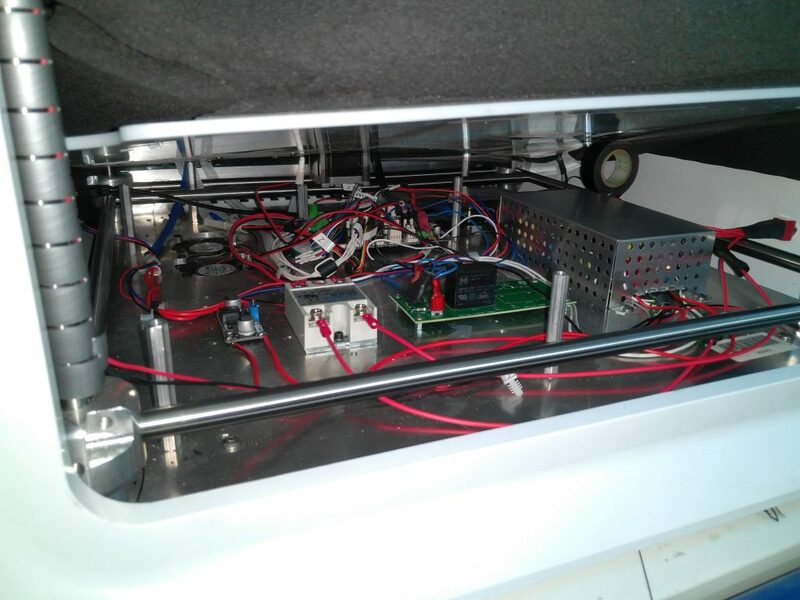 Great rebuild, did you change out the stepper motors for x, y and Z axis’s or were you able to reuse the original ones? Yes, we kept the original X, Y, and Z axis motors. I can’t remember if the windings we configured the same way as the duet, but it’s very easy to measure using a multimeter. Also, the datasheet are very easy to find. Make sure to note it once you open the printer! Thanks Philippe, My Duet came this week, so I will be doing my conversion very soon, just finished printing a Lcd enclosure that will fit over where the original one sits, I was considering going to .9 degree steppers for added accuracy. did your conversion with your extruders and hot ends gain you printing speed? and did the Duet make for smoother axis movements? Unless you are planning on printing extremely small details, the 0.9° steppers might not worth it. You’ll reduce both the maximum torque and maximum speed. 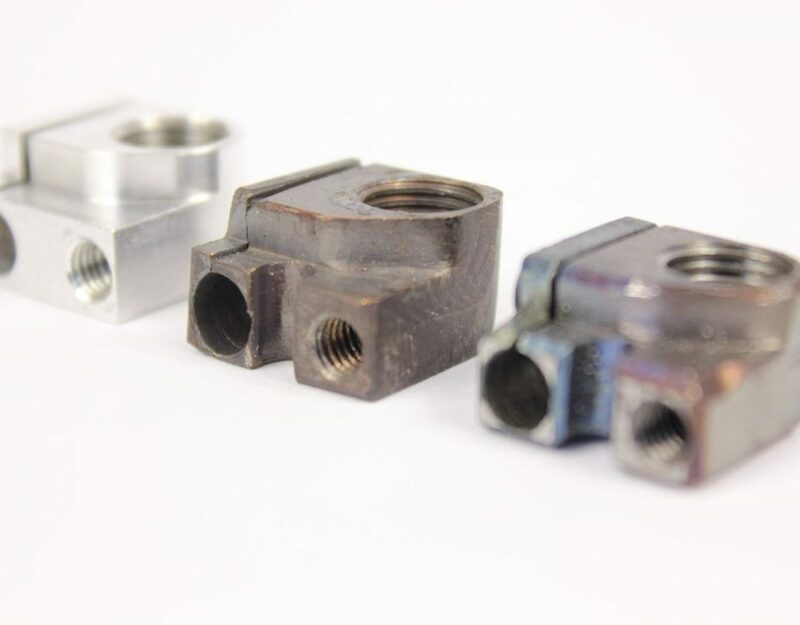 Yes, our extruder and hotend are able to output a higher flow than competitors. We can reach 35 mm^3/s using a 1.20mm nozzle. The Duet has Trinamic stepper drivers, which are in my experience the smoothest available. The firmware has to be configured for “Stealth Chop” for minimum noise and vibration. It’s quite impressive. Philippe, I’m well into my conversion, having an issue getting the 2 y axis Motors working together. i swapped y and z in the drive configuration. not working as expected, just wondering how you did it, did you just wire the 2 motors in series ? Glad to hear this project is going well. I checked inside our printer and we have kept the original cables wiring up to the ferrite, then made our own connector. Have you checked the phases? Maybe one wire from coil A got mixed with coil B. Do you have the specific link for the silicone heated bed from AiExpress? No, it was a custom made bed. We contacted the supplier from https://www.aliexpress.com/store/709519.